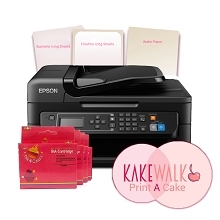 Our selection of Epson printers are top-of-the-line in the edible printing industry. Whether you are a skilled veteran, a beginner, or hobbyist, we have the right printer for you. Browse our selection and choose one today! 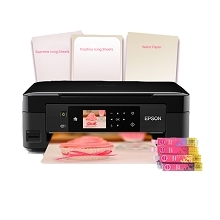 Epson PLUS Edible Printer Kit is a great choice for domestic to small business printing. Epson All in One Edible Printer . Wireless with compact design. 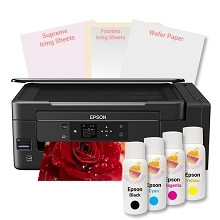 Epson Pro Commercial Edible Printer Kit is absolutely best choice for high volume printing . It's first edible system without cartridges with included ink up to 2 years of printing edible images on any type of edible papers. Bakers favorite ! 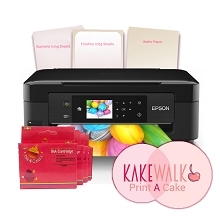 Epson Pro Edible Printer Kit is a great choice for professionals and commercial printing. 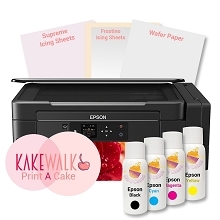 This bundle includes our Print-A-Cake software.